Elder Yoga Plus brings an uplifting start-where-you-are and do-it-your-own-pace approach to exercise for older adults–even those who use wheelchairs! Presented by 68-year-old yoga practitioner, Steffi L. Shapiro, who guides in a gentle, encouraging manner, the exercises are easy to do and paced especially for older adults. The video offers a relaxing head-to-toe workout with toning, circulation, flexibility, and breathing exercises. The video also includes chair exercises, ideal for beginners or those in wheelchairs, ‘massage’ exercises, and eye muscle exercises. 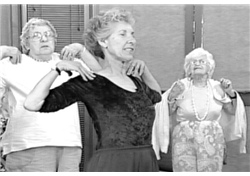 This stress-free workout can be the start or continuation of a life enhancing health and relaxation program for older adults. Comes with a mini-guide that lists the exercises and the areas they benefit.